Brigitte, or Jheng as we fondly calls her, is finally fulfilling your dreams and we are all hoping for your support! When people ask me how I started with blogging, I always say that it's because of my love for makeup and because of the Pinay Beauty bloggers I read online. There's Beautynomics, Askmewhats, SwipeSomeGloss (now Phoebeann.me) and I Am Sutil (now IamBrigitte.com). Whenever these girls would blog something, it was easy to get persuaded because they show unbiased and real reviews. For Jheng (Brigitte, hereon), shows how these products are done and she makes frequent FOTD's. Brigitte is the reason why I started to play with color makeup, from eyeshadows to eyeliners. She made me realize that blue eyeshadow can look good on me and wingtipping my eyeliner will make my eyes look amaze. If you notice, my technique is almost same as hers. When I met her during her makeup class, I couldn't help but exclaim! She was real! I often still can't believe that Brigitte has become such a dear friend of mine. And having had the blessing to be with her most of the time, I saw her passion in cosmetic artistry. I saw how the craft calms her. It was peaceful place for her whenever she does makeup on others... And unknown to many, I knew of her dreams to finally create her own cosmetic line! And now those dreams are finally coming true. But of course, not without your help! 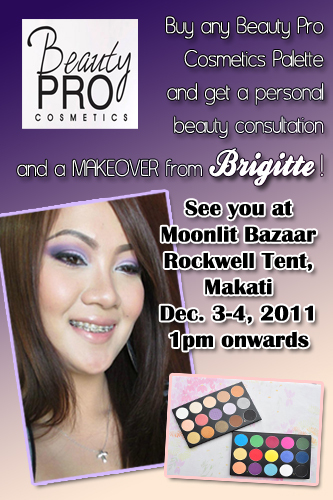 Join us at Moonlit Bazaar, Rockwell Tent on December 03 to 04, 1pm onwards, as Brigitte shares her knowledge and her story on how Beauty Pro Cosmetics came to be. See for your own eyes the sweat and tears that brought you two wonderful palette for all you makeup needs! And with every purchase, Brigitte will share her time to provide you with beauty tips and tricks, as well as makeover. She'll share how she creates number of looks with the Sweet and Smokey and Crazy Colour Palettes. If there's one thing I can say about Beauty Pro Cosmetics, it's not about having a business for Brigitte, it's sharing her dreams to everyone who is like her, an average girl who have an incredible love for the art of beauty. If you wish to purchase Beauty Pro Cosmetics, visit http://facebook.com/DigitalTraincase or email us at beautyprocosmetic@gmail.com.